The best off-grid solar kits come with all the essentials for solar energy generation. These essentials usually consist of the solar panels themselves, charge controllers, inverters, batteries, cables, brackets, and screws. With these products you can build a complete off-grid solar system. 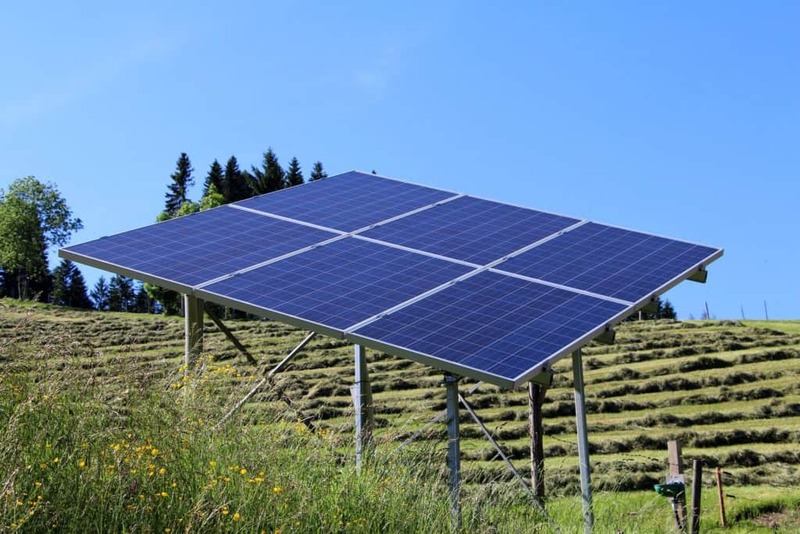 Since finding the top off-the-grid solar kits on the market can be difficult, we had to write complete a article of the top choices to choose from. We recommend looking at each of the below options and finding the kit that best suits your energy needs. In addition to this you should keep in mind the cost of the system as some can cost significantly more then others. First on the review is the Renogy 400W off-grid solar kit. This is one of the most popular starter solar kits and is intended for those who are new to solar or who are looking to expand their current system. The Renogy solar kit comes with 4 separate 100W solar panels. These monocrystalline solar panels are highly efficient and produce a lot of energy when tied together. These solar panels are highly durable and can withstand the wear and tear of the outdoors. They are built with a corrosion-resistant aluminum frame and anti-reflective tempered glass. In addition they come with a 25 year warranty to ensure that your investment lasts decades. This particular kit comes with a 30A PWM Wanderer Charge Controller. This charge controller is connected to both the solar panels and the deep cycle batteries (batteries are not included). Its purpose is to limit the rate at which electric current is added to or drawn from electric batteries. The Wanderer is an exceptional charge controller that comes with a sealed, Gel and Flooded charging algorithm. It uses a 4-stage battery charging process for rapid, efficient, and safe battery charging. Just keep in mind that if you end up buying more solar panels then you will most likely need to upgrade the charge controller. The Renogy 400W solar kit also comes with one 20ft 10AWG MC4 Adaptor Kit, one 8ft 10AWG Tray Cable, three pairs of branch connectors, and four sets of Z-brackets. In the end the Rengoy 400W off-grid solar kit is a great option. It’s ideal for those first getting into solar or who are looking into expanding their current system. There is also another version of this kit that includes batteries and an inverter if you want a complete kit. Perfect for those with small energy requirements. Built to last years in the outdoors. Small price makes it ideal for those on a tight budget. Doesn’t come with an inverter or batteries. Next on the list is the Grape Solar 400W off-grid solar kit. This is a quality kit with a very powerful inverter. The only draw back is that its not a complete kit as deep-cycle batteries are not included. are high quality panels that are built with an anodized aluminum frame, sealed junction box, tempered glass. Making this panel completely weather proof and perfect for decades of use in the outdoors. One negative thing about these solar panels is that they use polycrystalline solar cells. These cells are less efficient then monocrystalline and thus must be larger in order to generate the same amount of energy. So this is something to keep in mind if you have minimal space. This kit also comes with a powerful 35 Amp charge controller. This PWM charge controller can with with both 12V and 24V battery banks. In addition you can add one more 100W solar panel to this kit without having to buy a more powerful charge controller. As we mentioned above this kit doesn’t come with batteries, but it still comes with an inverter. This 1,800W inverter provides enough power for almost any appliance. It comes with dual AC receptacles and an integrated USB port. Overall the Grape Solar 400W off-grid solar kit is a good low budget option. It comes with almost everything you need to create an off-grid solar system. The only negative thing is that it doesn’t come with batteries. Which will cost another few hundred dollars. Dual AC ports and USB port. Next on the list is the WindyNation 400W Off-Grid solar kit. This is one of the best complete start kits on the market. It comes with all the essentials you need to being generating solar energy. The only negative thing is that it uses polycrystalline solar panels. This WindyNation solar kit comes with 4 solar panels. As mentioned above these panels are made out of polycrystalline technology. While they generate 100W of energy each, they have a low energy conversion rates. Since their conversion rates are smaller then the above option, the panels have to be slightly larger to generate the same amount of energy. This means you must have a much larger area of space to place these solar panels on. Which is an issue for some. The Windy Nation kit comes with a 30 Amp charge controller. This efficient charge controller regulated the energy that comes from the solar panels to the batteries. To store this energy the kit uses 4 100Ah deep cycle batteries. These batteries and maintenance free and can store up large amounts of energy. To regulate the energy the batteries to your devices is a powerful 1500W VertaMac inverter. This inverter provides plenty of energy to supply your energy and allows you to expand this current system if you like. Overall the system produces 135 Amp hours of charge per day (depending on sunlight availability). In the end the WindyNation 400 off-grid solar kit is a good option to choose from. This kit comes with everything you need to start generating eco-friendly energy. The only negative thing about this device is that it uses older solar panel technology. So keep that in mind when looking at this kit. Complete solar kit come with everything you need. Large batteries can store a lot of energy. Next on the review is the Eco-Worthy 800W off-grid solar kit. This is a large solar kit that comes with almost everything you need to begin your own solar system. Its large amount of energy generation makes it ideal for larger homes or cabins. This particular kit comes with 8 polycrystalline solar panels. These 100W panels are made with heavy duty aluminum and low Iron, high transparency tempered glass. This glass protects the solar cells while allowing them to convert as much solar energy as possible. All of the panels come with 25-year transferable power output warranty. This includes 5-year/95% efficiency rate, 10-year/90% efficiency rate, 25-year/80% efficiency rate. This is very important as it protects your investment. The Eco-Worthy kit comes with a 45 Amp charge controller. While this is a good charge controller, its relatively low energy rating compared to other kits on the market. This kit doesn’t included batteries, but uses a 3,000W pure sine wave inverter. This is an extremely powerful inverter and allows you to add more solar panels to the solar system if you life. In addition to an inverter this kit also comes with a solar combiner box. Overall the Eco-Worthy is a top contender when looking at large solar kits. While it uses polycrystalline solar panels, it has a powerful inverter that allows you to add solar panels to the system. So check out this solar kit if you need a lot of solar energy with the possibility of adding more. Comes with great solar panel warranty. Uses an extremely powerful inverter. The Renogy 800W Off-Grid solar kit is by far one of the best solar kits on the market. Reason for is because of the high quality materials they are made from and high energy output. They can power almost any off-grid home for years if not decades. This kit comes with 8 monocrystalline solar panels. These 100W panels are extremely efficient and have a transfer rate of 18.4%. This high efficiency allows the panels to be much smaller in size while producing more power. These panels are made from durable aluminum metal and tempered glass. They are premium solar panels that will last decades if maintained properly. In addition they come with a 25 year warranty. In addition to premium solar panel the kit also comes with a 60A MPPT charge controller. This charge controller features multiphase synchronous rectification and maximum power point tracking technologies, which help increase charging efficiency. To capture this energy the kit comes with three 200 Ah AGM batteries and a 2000W inverter. This is enough to power most small off-grid homes and enough to expand the system if needed. In addition to these items the kit comes with all requires cables and wires. In the end the Renogy 800W solar kit possible the best option when looking for off-grid power. The system comes with premium materials and parts and will last years if maintained properly. In addition the kit is extremely power and can be expanded if needed. So if you’re looking for a premium solar kit then this is the option for you. Uses 8 high quality monocrystalline solar panels. Large batteries allow you to store large amounts of energy. In this modern age solar energy is becoming one of the best avenues to generate energy when going off-the-grid. These eco-friendly devices use the energy from the sun to power you’re everyday devices. Off-grid solar kits have a ton of benefits, some of which we’ll discuss down below. The first and most obvious benefit us that solar kits are good for the environment. They convert energy from the sun into useable energy for your home. This process is noise free and doesn’t produce any harmful wastes like gas generators do. In addition to this over the long term solar energy has an reverse effect on global warming. A huge benefit to solar kits that we hinted to above is that they are noise free. Most people who live off-grid use gas generators that produce a lot of noise This noise pollution can be so loud that it can ruin the experience of living off-the-grid in the first place. So do yourself a favor and purchase a noise free solar kit. One major benefit of off-grid solar kits is their convenience. They are convenient because they allow you to have power anywhere that has sunshine. So if you want to live in the mountains with no power lines then off-grid solar kits are perfect for you. Another cool benefit of solar kits is their long lifespan. Most solar panels can last anywhere from 20-30 years while other parts of the solar system last 10-20 years. In addition many of these kits come with long warrenties that will replace the part if it breaks within the stated warranty date. Overall off-grid solar kits have a ton of benefits. They are truly a great investment and will serve your well if installed properly. Just keep in mind that some of the above kits don’t include racks, batteries, or inverters, which are needed to have a full functioning off-grid solar system.